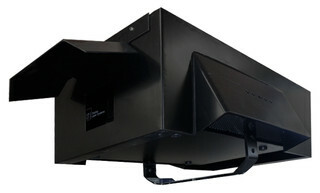 The RTI NANO Dark Weather is a rain protection housing, especially designed for show laser devices of the RTI NANO Series. This durable aluminum housing encloses the laser projector and thus protects it reliably against rain, snow and further environmental influences. The upper part of the laser aperture has an additional protective cover and at both long sides of the housing ventilation slots ensure air circulation to prevent overheating. The RTI NANO Dark Weather rain protection housing is &apos;Made in Germany&apos; and perfect to protect RTI NANO devices at fixed installations and during temporary events.